That’s a challenge, and God’s Word has much to say about how we as parents can meet that challenge. It shows us how to provide the kind of discipline that helps our children fulfill their responsibility. If the most important thing for our children to learn is to obey, what do we do when they won’t? First, it’s important to understand how your parenting approach may be contributing to the problem, especially in a culture that has made discipline a dirty word. To speak of a parent disciplining a child today evokes images of unreasonable anger and brutal beat­ings. That’s not biblical discipline. Two case studies — one sociolog­ical and the other biblical — show us what appropriate, godly discipline is all about. 1. The Permissive Parent. 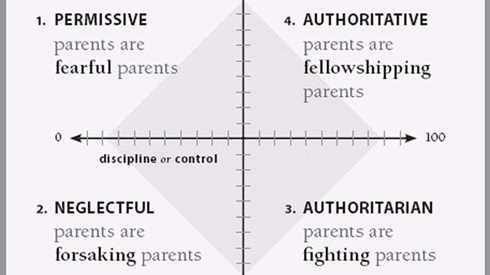 The upper left quadrant represents parents who are high in love but low in discipline: the permissive parent. The study revealed that permissive parents tend to produce children with very low self-esteem and feelings of inferiority. Though the parents express a lot of love, the lack of boundaries leaves their children with a high level of insecurity. The kids feel loved, but they are never sure of their limits. Their parents are generally fearful, afraid of messing up and damaging their chil­dren’s psyche, so they never set firm boundaries. The kids feel very loved and very unsure of themselves. 2. The Neglectful Parent. The lower left quadrant belongs to the worst of all four combinations: the neglectful parent. This kind of parent doesn’t express much love and also doesn’t really care enough to discipline. 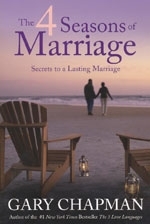 Their children tend to grow up with little or no lasting relationship with Mom or Dad. They’re estranged because they feel forsaken. The parents’ neglect may not neces­sarily be intentional — they may simply be in the midst of their own traumas and chaos, like an addiction or an abusive situa­tion. They don’t purposely desire to neglect their kids, but they don’t know how to deal with their own issues adequately and don’t have the tools to be healthy parents. These children grow up with unbelievably deep emotional scars, and their only hope is to find Christ, be surrounded by godly role models, and get some good Christian counseling. 3. The Authoritarian Parent. The authoritarian parent shows up in the lower right quadrant. This kind of parent doesn’t express love and affection well but is very high on discipline. They raise children who are provoked to rebellion. The bar is always high and the “musts” are always abundant, so there’s a strong sense of safety. But this kind of parent isn’t content just to win the war; they have to win every battle too. Communication between parent and child takes the form of arguing and fighting, espe­cially when the child is old enough to fight back. Authoritarian parents squeeze their kids until the kids can’t wait to leave home, and as soon as they do, they rebel. When Paul told the Ephesians not to overcorrect their children and exasperate them, he was warning authoritarians not to raise children who would reject the faith altogether. 4. The Authoritative Parent. Those who land in the upper right quadrant provide the best combination of love and discipline. This kind of parent is authoritative — not an overbearing authoritarian, but a compassionate yet firm authority. They have clear boundaries but are also very loving. Everyone knows who the boss is, but there’s also a connection between parents and child, a consideration that respects and honors who the child is while not compromising his or her disciplinary needs. 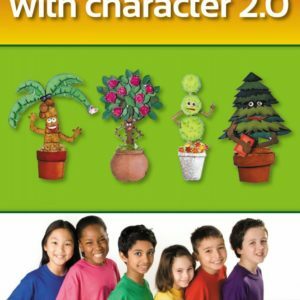 The result is a child high in self-esteem and equipped with good coping skills. This secular sociological study found that the parent who balances love and discipline, without compromising either, produces well-adjusted kids who maintain a positive relationship with Mom and Dad. This research, the best available today, affirms parents who express love well and maintain a high degree of control in their home. All of us want to be in quadrant four, and probably most of us think we are. But before we move on to our biblical case study, consider these questions: Where do you tend to err? If you had to pick a quadrant other than number four to represent your worst moments as a parent, which would it be? Make a mental note of your answer; it will help you later when we look at our parenting through new lenses. Taken from “Effective Parenting in a Defective World” published by Tyndale House Publishers, Inc. Copyright © 2006 by Chip Ingram. All rights reserved.